Dwayne Thompson addresses scholarship recipients during a banquet held in their honor. 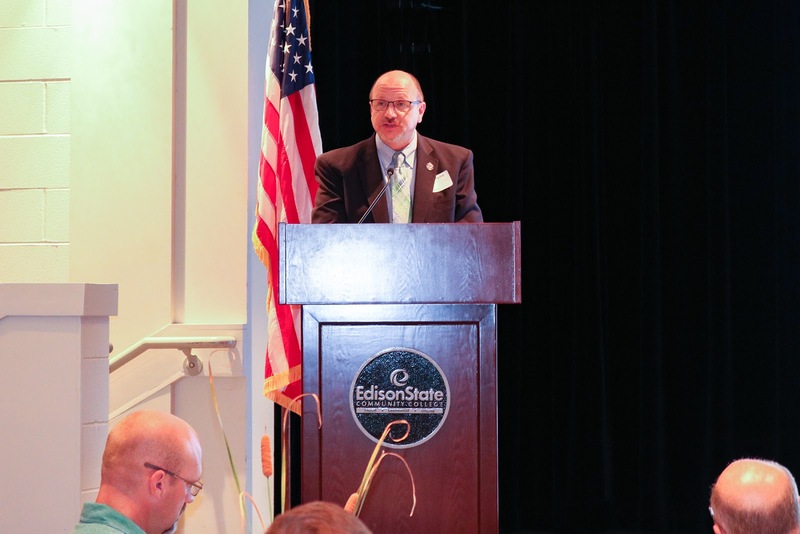 Edison State Community College in partnership with The Edison Foundation recognized over 110 students during the annual scholarship recognition dinner on Thursday, October 4. The event provides recipients with the opportunity to meet the patrons that made their scholarships available. Following networking and dinner, Dwayne Thompson, Edison State alumni, and Piqua City Schools Superintendent talked about some of the obstacles he had to overcome as a first-generation college student. As a lifelong resident of Piqua, Thompson was well-aware of Edison State but initially chose a different route, pursuing education from a four-year university. After graduating from Edison State, Thompson went on to receive a Bachelor’s Degree in Elementary Education from Ohio University and most recently completed a Master’s Degree in Early Childhood Education as well as Superintendent Certification from Wright State University. Thompson has since served as a teacher, principal, curriculum director, assistant superintendent and now superintendent over the past 26 years - all in the Piqua City Schools System. He was selected as the Piqua Teacher of the Year in 1999 and was a finalist for State Teacher of the Year in 2000. His wife, Merrianne, is a teacher at Piqua Central Intermediate School where their 6th-grade twin daughters and 5th-grade son also attend as students.